Gingerbread cookies are such a treat. If there’s any bad wrap to them it’s because of those box kits for gingerbread houses with stale pieces inside. For the best results you just have to bake your own. There is a lot of molasses in this recipe so it really requires overnight chilling to set, which just means a little planning ahead. I really liked the spice profile of this recipe but you can play with it and add more of your favorites and eliminate the one’s you dislike. Preheat the oven to 350 degrees F. In a large bowl, sift the flour, ginger, cinnamon, baking soda, nutmeg and salt. 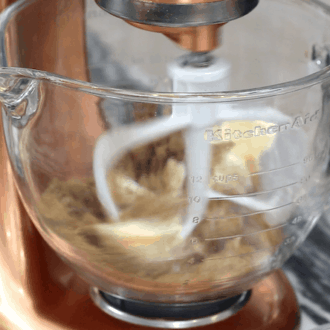 In a stand mixer fitted with a paddle attachment, cream the butter and brown sugar on medium speed and mix until it’s fluffy. Add in the molasses, egg and vanilla and mix until combined. Gradually add in the flour until a nice dough is formed. Roll into disks, cover with plastic wrap and refrigerate for about 4 hours or overnight. 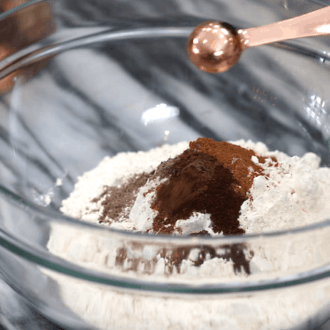 For the icing; sift the powdered sugar into a bowl, add the egg white and mix until combined. Add the cream of tartar once they become frothy. Add water until a desired consistency is reached then transfer it to a piping bag. Roll out the dough out until its about 1/4 inch in thickness. 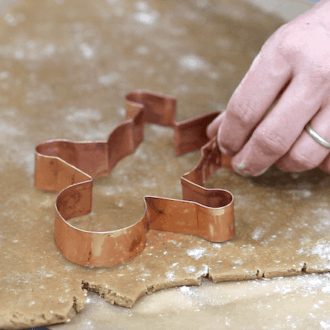 Cut out the gingerbread people with a cookie cutter and transfer them to a baking sheet. For the gingerbread people holding the candy cane nugget, roll up a ball of aluminum foil and bend the arms around the ball before baking. Bake cookies for 10 minutes and let cool. Once your gingerbread people are cool, pipe a shirt, pants and facial details. Attach sprinkles for buttons and eyes. You can also add candy cane nuggets to gingerbread people with bent arms. 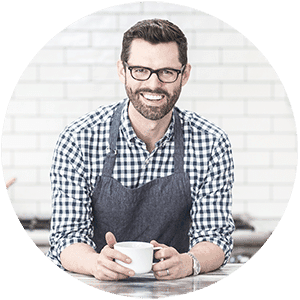 If you’ve tried these men then don’t forget to rate the recipe and let me know how you got on in the comments below, I love hearing from you! 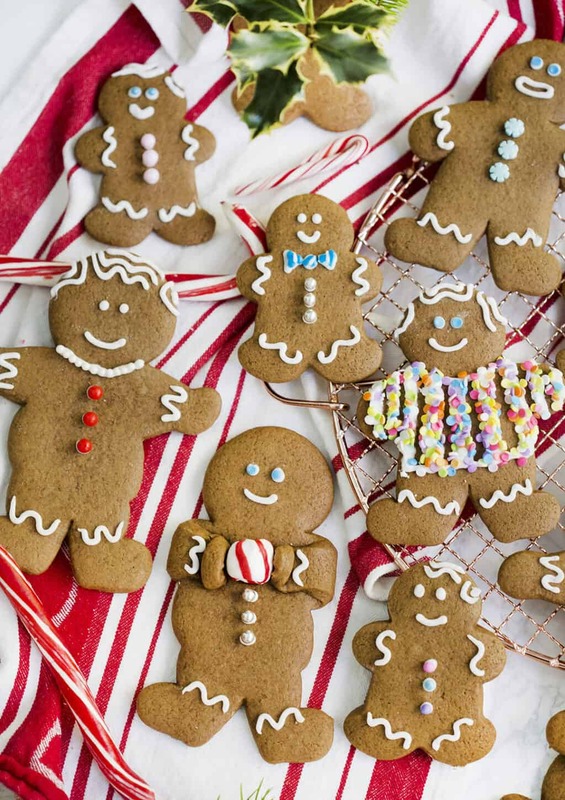 Spicy and delicious gingerbread cookies that don't spread all over the place! Using a stand mixer fitted with a paddle attachment, cream butter and brown sugar on medium. Mix until fluffy. Add in flour gradually until a nice dough forms. Roll into disks. Cover with plastic wrap. Refrigerate for about 4 hours or overnight. This step is important because the dough gets soft quickly. Roll out dough about ¼-inch in thickness. 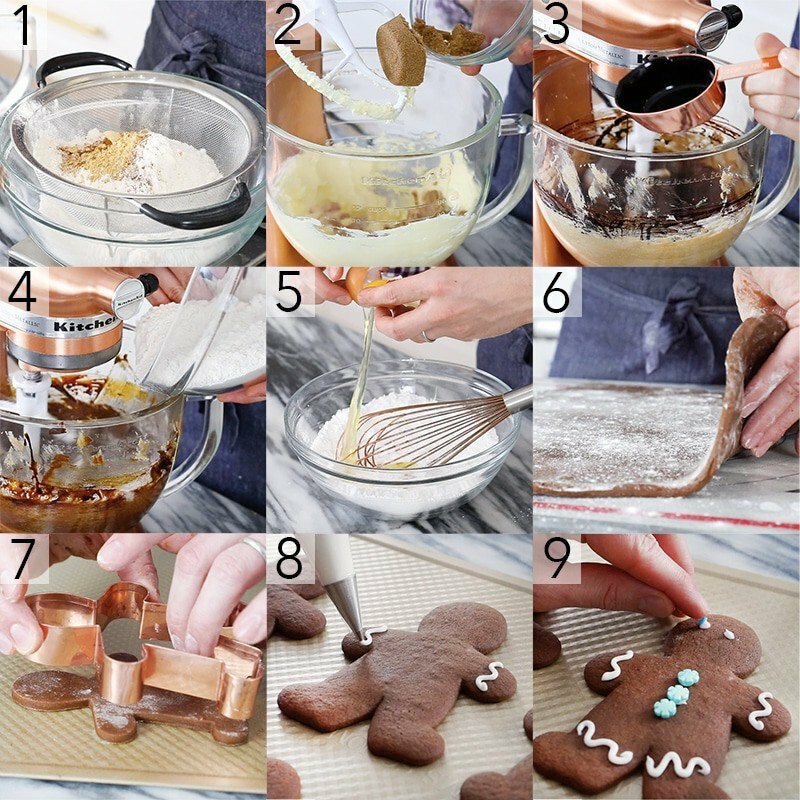 Cut out gingerbread people with a cookie cutter. Transfer to a baking sheet. For the gingerbread people holding the candy cane nugget, roll up a ball of aluminum foil and bend the arms around the ball before baking. Bake cookies for 10 minutes. Let cool. Beat the egg whites and add the cream of tartar once they become frothy. Once combined, add the water until desired consistency is reached. Pipe a shirt, pants and facial details. 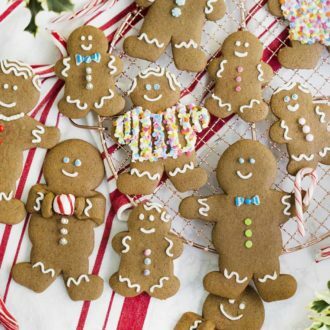 Add candy cane nuggets to gingerbread people with bent arms. Cut back on the molasses for a lighter cookie. Alter spices at will, you might want less ginger and more cinnamon! Remember that this recipe really needs dough that chills overnight or for at least a few hours. These are so amazing and traditional cookies for Christmas. Thank YOU! I agree, these guys are great to have around for the holidays! One day soon I hope!